Volkswagen and Ford are in talks about various joint projects. According to a report, they are working on a van project, as well as others. A few years ago, someone in the auto industry – I think it was Sergio Marchionne, the head of Fiat Chrysler Autos – who said that the future of the auto industry was in consolidation and in combination. Marchionne, indeed, tried to peddle his auto company first to General Motors and then elsewhere, but, in the end FCA is still going it alone, though who knows what the future might hold. In another area, Volkswagen and Ford are in talks about jointly developing commercial vehicles. According to Reuters, the automakers are discussing producing a range of vehicles including vans. Earlier in the day, a story had appeared that indicated Ford and Volkswagen were in talks about the joint production of vans. Volkswagen and Ford, in a late statement, indicated they were considering a strategic alliance on trucks. The joint statement said they were “investigating several joint projects” including a range of commercial vehicles for the global market. There was no equity swap or cross-ownership, the companies emphasized. Instead, they were discussing specific joint projects. In their brief statement, the automakers did not provide further details. However, they did say that VW and Ford were “exploring potential projects across a number of areas” including commercial vehicles. It makes sense, in a funny way, that VW and Ford should be discussing vehicles development. Ford has been made the best-selling U.S. pickup truck for nearly 5 decades. Its F-series is the best-selling U.S. pickup and has been since 1970. Volkswagen, which produced its first light truck for the U.S. market last year in the Atlas, owns MAN and Scania truck brands in Europe, but there is no pickup or smaller commercial vehicle in its U.S. and other products. 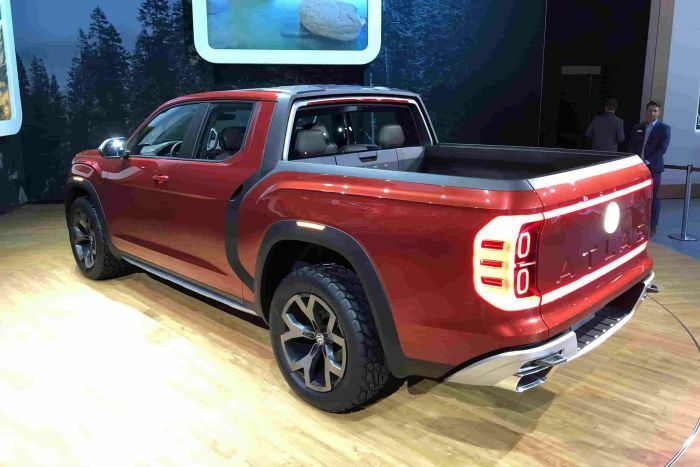 Yes, it is true that VW is working on developing a pickup version of its popular Atlas, but it is nowhere near ready yet and while it does have a European pickup that has been quite successful, the Amarok, the diesel pickup won’t be offered in the U.S.